Are you an anglophile who indulges in the frequent mopping of your brow? If so, Drake’s has a handkerchief for you. 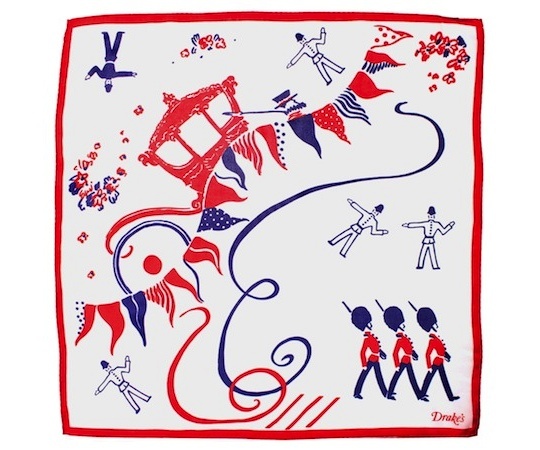 A tribute to the Queen’s Diamond Jubilee—her 60th year as monarch—this limited-run pocket square has some soldiers and bobbies posing under flags and flowers for a lively bit of cloth. Handmade from 100-percent silk, only 100 are available at Drake’s. This entry was posted in Accessories and tagged Diamond Jubilee, pocket square. Bookmark the permalink.